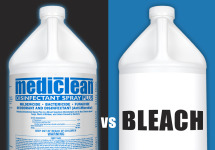 Bleach is quite caustic and irritating – MDSP has a neutral pH and is non-corrosive. Bleach can corrode metals and damage fiber dyes – MDSP will not damage these surfaces. Bleach doesn't provide residual protection after initial application – MDSP offers residual bacteriostatic and fungistatic capability. Bleach leaves significant amounts of residue that can be quite difficult to remove – MDSP has minimal residue. BONUS REASON TO CHOOSE MDSP: Bleach has a noxious odor – MDSP has a mild, pleasant scent, and is also available in a fragrance free version. ANOTHER BONUS! The “plus” in MDSP refers to the product's mild detergency. This helps break up and remove soiling to aid in cleaning. Bleach does not have this feature.